Continuing the series of diaries and letters of Alfred Thomas Osmond, relating to his sea voyage from Southampton to Calcutta and his early months in Calcutta, 1852-1853. Alfred Osmond was the son of Rosemary Monk’s Great great great Grandfather William, who was a stonemason at Salisbury Cathedral. Coaling commenced early this morning. Gangs of Hottentots and Malays are hauling it up at different gangways, all singing in chorus with great energy. They cannot work without singing, it is surprising that they keep it up as they do the whole day – 14 or 16 hours. If the weather continues favourable we shall complete the coaling in 3 or 4 days. We shall take about 600 tons. It is very expensive as there is such a great demand on account of the emigrant vessels calling here. We shall get about 300 tons at about £3 a ton and the remaining 300 tons at £6!! I went on shore with the Doctor and 3rd and 4th Officers and thoroughly explored the place. Went into sundry shops, which were as well fitted and supplied as English ones. There are several places of worship of different denominations and some wretched attempts at Gothic in brick and plaster. Some of the gables of the houses are quite Elizabethan in character. The Cape is celebrated for horses and the equipages are first rate, sent from England. We returned to the Bentinck to dinner. The screw steamer, the “Melbourne”, arrived this evening. She has been very unfortunate, they were detained at Lisbon a long time repairing damages, they had a mutiny there and 1 man killed. A large number of passengers left her before she left Lisbon. The captain of the Styx paid us a visit this evening. Two emigrant ships left for Australia today. Emigration is going on here to a great extent, and the consequence is that labour is very dear. The Malays who are coaling our vessel receive 5/- (25p) per day and an allowance of beer etc. I met a young man on shore at an hotel who is a passenger in a vessel which left Liverpool for Australia more than 4 months ago. They had 400 emigrants on board – 32 of whom have died in consequence of remaining on shore one night at St Jago (probably Santiago in the Cape Verdi Islands in the Atlantic off West Africa ) exposed to the heavy dews and which produced fever. Their Captain left them there and the Chief Officer seems incompetent to manage. They leave Cape Town for Port Philip on Wednesday. The emigrant vessels seem to be badly managed. The Captain came on shore this morning and arranged that I should join him and Mrs B in an excursion to the famed Constantias. This excursion is made by all who visit the Cape. The Constantias are 3 estates or vineyards called by that name – they are about 13 miles from Cape Town and are the property of some Dutchmen. 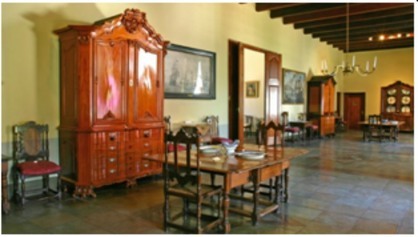 They are exceedingly hospitable and all visitors are shown the cellars and invited to taste the wines. I went on shore about noon and took lunch with the Captain. We then started in a splendid turn-out – a carriage and four of the finest horses I ever saw – well matched in colour, height etc. capital plated harness – such a team as you rarely see in England. Our driver was an old Hottentot who is reputed the best whip in Cape Town. Our English friends would have stared in astonishment at the dash we made. But it is not thought so much of here. Such teams of horses, mules and bullocks as are used here are not often seen elsewhere. The Hottentot drivers seem born for the purpose, they handle their long whips with great dexterity. I saw one fellow driving 12 mules – another 10 – and several of 8 in hand. The omnibuses (of which there are several) all have 4 horses. The roads are in some places very difficult, being covered with sand to the depth of nearly a foot – this is the reason for driving such teams. The horses are of a slighter make than our English ones, but they are very handsome. There is a cab stand in one of our principal streets, where you can get a well appointed Hansom, as good as any in London. Our drive to Constantias was delightful. The villages are very like English ones – I could have imagined myself in one of the southern counties of the old country. The oak flourishes here, also firs of various kinds. There are monkeys and jackals on the mountains. The Dutch villagers are remarkably clean – their cottages are quite patterns (?patterned). I saw numbers of aloes planted close together forming hedges. In one row of them I counted at least 20 in bloom – I should say about 25 feet high. 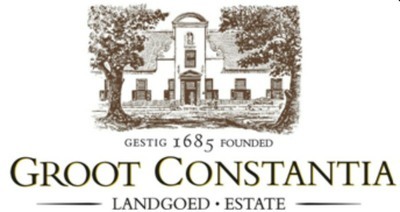 The constantia we visited is called the “Great Constantia” being the most extensive. 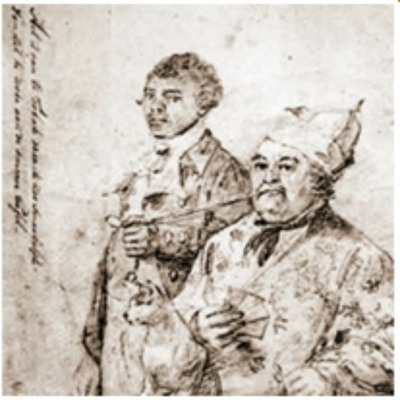 It is in the posession of Mr. Cloete whose family it has belonged for many generations. Our Captain knows him, and we were received very cordially – shewn into a spacious drawing room and introduced to his family. After chatting an hour, his son and two daughters shewed us the grounds and gardens which are extensive and beautiful, but may be made much more ornamental. Everything has been left to nature. Flowers and fruit trees are scattered about hill and dale, with no regard to order or arrangement. From some points in the gardens you get beautiful views of Jalse Bay. We entered an orchard of apricot trees – very large trees, on shaking them the apricots fell in hundreds. What a place for a troop of English schoolboys! 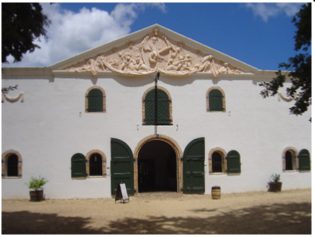 We visited the cellars and tasted red and white constantia wines – they are very luscious. We agreed that the white is best. On re-entering the house we found fruit, cake and wine awaiting us in the drawing room and we shortly after wished this worthy Dutch family goodbye and departed laden with flowers and fruit. This Dutch family was once found fruit, cake and wine awaiting us in the drawing room and we shortly after wished this worthy Dutch family goodbye and departed laden with flowers and fruit. This Dutch family was once very wealthy. Mr Cloete told me he lost greatly by the emancipation of slaves. We enjoyed the drive back exceedingly – we were screened from the sun by the Table Mountain. It was just like a calm July evening in England. We reached the Captain’s lodgings at 7 in time for dinner (they keep aristocratic hours here). The lodgers in these boarding houses dine together. Among the company today were two Yankees (Captains of small vessels I believe) who sat opposite to us. They were evidently unused to the stylish manner of living which is the order of the day. The finger glasses at dessert puzzled them exceedingly – one of them eyed his distrustfully for a short time then thinking he had guessed the use thereof, made a bold strike and drank it off at a draught! The other seeing this, sipped his contentedly. Our visible muscles were sorely tried by their performance, and it was a great relief to give them full play when the Yankees retired. It was too late to leave shore so I enjoyed a bedroom in the same house. The rooms are beautiful, cool and very lofty. My bedroom was about 14 feet in height – they keep the shutters closed during the heat of the day. No ceilings but the floors and joists of the room over are visible. The Captain and his lady retired early – I remained for an hour to chat and smoke a pipe with an officer attached to the Commissariat, who has been all over the world and is a very agreeable companion. Breakfasted at 9 this morning. New bread, fresh butter and eggs, coffee, cold meats and fresh fruits formed our repast. How I enjoyed the new bread and fresh butter! (We have had no bread on board for 3 weeks and have been obliged to put up with ship biscuit and our butter is very salt). Captain could not tell me what my share of the expense of yesterday’s excursion is, because he keeps a running account at the livery stables. I must remember to pay him after we leave. I spent an hour or two exploring the town and then went on board again. Got very wet on my way back to the ship – the sea is so rough that (no) coaling was done today. The Bentinck is anchored more than a mile from shore. Sometimes a Southeaster blows off and prevents all communication with shore for some days. When this wind is blowing the “Table Cloth” is invariably on the mountains. A Dutch frigate entered the bay this morning, she fired a salute and was answered by 21 guns from the English fort. The S.easter has been blowing hard all day. If I had not left shore this morning, I must have remained until tomorrow. Played chess this evening with Mr Munro. Fine clear morning and sea quite calm again. Coaling is progressing vigorously. There is a great difference in temperature on board and on shore. On board it is 65 to 70 (18 – 21 C) on shore from 75 to 80 (24 – 27C). This is the first month of summer – it will be much hotter in January and February.